3-2-2016 - Erik Buell Racing, an East Troy motorcycle manufacturer, is gearing up to produce bikes again - less than a month after it completed a restructuring similar to bankruptcy. 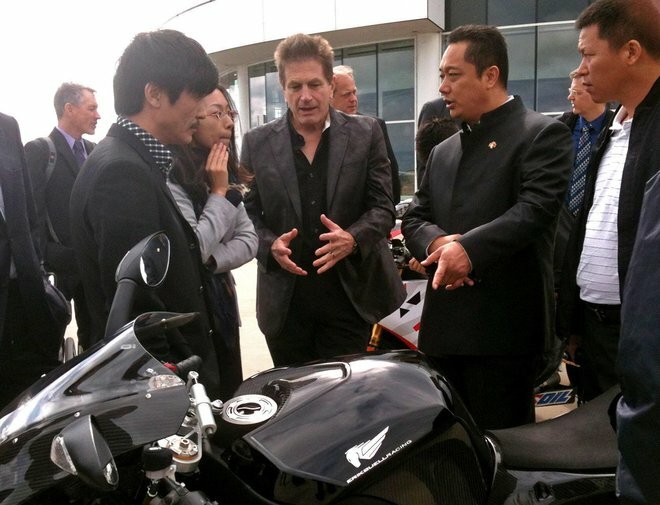 Erik Buell (center), founder of Erik Buell Racing in East Troy, talks to potential investors about a motorcycle in this 2012 photo. Erik Buell Racing, an East Troy motorcycle manufacturer, is gearing up to produce bikes again — less than a month after it completed a restructuring similar to bankruptcy. Manufacturing on a limited scale could begin in March, according to Liquid Asset Partners, a Grand Rapids, Mich., firm that acquired Erik Buell Racing in a January auction. The goal is to produce 2016 model-year motorcycles while, at the same time, Liquid Asset Partners seeks a buyer or investors for Erik Buell Racing. "Those are some of the plans we are working through right now. We are talking to a lot of parties, and we are having open discussions with investors, banks and others," Liquid Asset Partners owner Bill Melvin Jr. said Monday. Erik Buell Racing is the sequel to Buell Motorcycle Co. that Harley-Davidson Inc. owned for more than a decade before Harley dropped the brand in 2009. The East Troy plant employed about 130 people until it ceased operations 10 months ago. Bikes were left unfinished on the assembly line when the company filed for Chapter 128 receivership, a state court procedure similar to bankruptcy. Now, under Liquid Asset Partners, company founder Erik Buell and an Erik Buell Racing management team are restarting the business. Production is expected to ramp up slowly, with a few employees. "The old company had many of the pieces in place for success, and I am very energized by the opportunity to re-engage under a new corporation with the right ownership and focus," Buell said. Liquid Asset Partners "believed that it was a viable business, and not just something to sell off in pieces," Buell added. The company now has motorcycle parts available for Erik Buell Racing bike owners — a move Buell said was important to him personally. "I was just mortified at the thought that (customers) might be left without help," he said. Buell motorcycle owners are encouraged that Liquid Asset Partners has kept the company intact, said Robert Wade, a Buell enthusiast from Indianapolis. Erik Buell has been in the motorcycle industry for more than 30 years, having started his original company in 1983 in a barn in Mukwonago. Going forward, Buell says his role with the new company will depend on the ownership and organization. "I have done a lot of things with the business, and I still have a lot of love for it and a lot of energy for it," he said. Buell, an engineer by profession, is known as a maverick with a competitive racing streak. "Erik Buell's passion for motorcycles, and his ability to convince others that his ideas have validity, are unquestionable. Erik is probably the closest that the motorcycle industry gets to a Steve Jobs-like evangelist," said Dean Adams, who runs the website SuperBikePlanet, in Red Wing, Minn.
"There are world-class engineers who have turned their lives upside down in order to work for Erik, move themselves and their family to Wisconsin, only to lose their jobs and have the backbone of their family's life disappear when his business plan is unsuccessful and fails in a huge way. You would think that these people would be waiting for Erik in the employee parking lot with a tire iron, after seeing that the business plan they were hired under was based on nearly irrational hope. Yet they remain friendly and almost devoted to Erik. He's a very charismatic individual, especially, I think, if you're an engineer," Adams said. Court records showed that Erik Buell Racing had $20.8 million in assets and $20.4 million in liabilities when it sought receivership. Liquid Asset Partners paid about $2million for the company. Buell said he has learned a lot from his experiences. Now, he said, "Even if there was a large amount of money available, I would still strongly push for starting slowly and carefully. I think the biggest thing is not rushing in."